Here it is, the most important Audi in decades; the all-electric e-Tron SUV. The first step of a ascendance from nitrogen dioxide sinner to aspiring zero-emission saint, the handsome-looking EV is just the beginning for Ingolstadt’s electric plans. After this, there’ll be a flurry of EVs from the four rings, with a Sportback and a J1-based e-Tron GT Coupe following soon after. 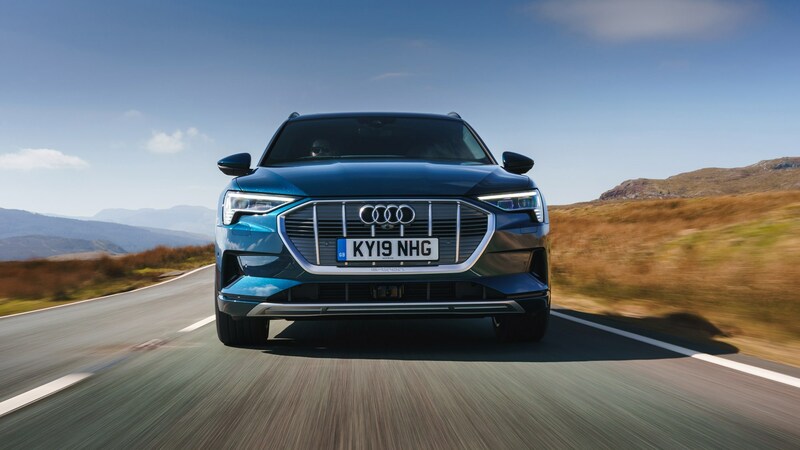 Available to order now with the first UK deliveries only just rolling out of the factory, the new 2019 Audi e-Tron has a certified 241-mile electric range, and promises trademark Audi performance, four-wheel drive, the usual quality interior – and cleaner guts. We were there when the e-Tron was first revealed in San Francisco, and we’ve driven it on the worldwide launch, too. It can tick all the boxes in Dubai – but can the e-Tron do it on a cold day in North Yorkshire? Keep reading for our full UK review. What's the UK-spec Audi e-Tron like inside? Slip into the e-Tron, and it fits Audi’s tagline for the car perfectly. ‘EV goes Audi’ is the ethos inside and out, and that means the e-Tron’s cabin could be in any Q car. The touchscreen-heavy cabin invites you to swipe and pinch just like the A8 – and even the steering wheel isn’t particularly EV-alike. The cruise control switches are lifted straight from the TTS we’ve driven here, and there are paddles, too – which we’ll get to later. In fact, it’s the only the transmission where the e-Tron dares to be different – and that’s because it doesn’t have one. Instead, the area between the passenger and driver is full of storage space with cubby holes, cup-holders and a wireless phone charger all packed into a rather bulky, plastic frame. We’d rather the empty space. Still the e-Tron does differentiate itself with an unusual thumb-flicking drive selector. Mounted under a hand rest, it’s pleasingly tactile - and is clicked forward and back by your thumb and index finger. It’s a small thing, but it’s something you’ll notice every time you drive. Well. how does the e-Tron actually drive, then? Click into Drive, gingerly apply the throttle – this car won’t creep forward like a Tesla – and the firmness of the pedal is the first big surprise. The e-Tron is a 2.5-tonne SUV, with a right pedal more McLaren-like than you’d think. It quietly makes you less blunt with your inputs, and in S mode, it gives the car a sportier feel, too. It’s a win-win. Flex the power of the e-Tron with your foot to the floor, and it accelerates in a progressive, but ultimately physics-bending way, and eerie silence is quickly overtaken by wind and road noise. What’s it like to drive in the UK? That instant torque makes entering roundabouts easier, allowing you to more safely dart into gaps, and it makes overtaking a simple, effortless experience, too. Passing another car is as simple as checking the oncoming traffic, easing on the power and slotting in front. No hesitant kickdowns, no noise – just a whoosh. Seamless. As for the ride? 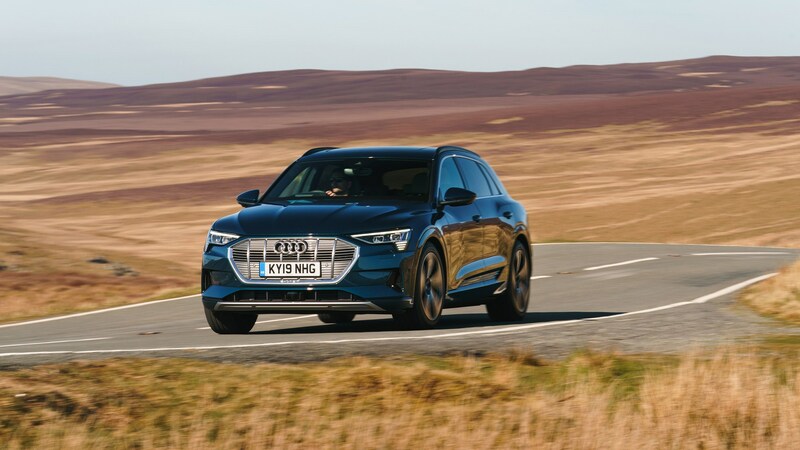 Even on North Yorkshire’s roughest roads, the e-Tron delivers a composed, and planted ride comfort regardless of the setting you’re on. Flick into Comfort using the very familiar Drive Select button, and you’ll find the throttle response rounded off, lighter steering and the bumps smoothed out. Move over to Sport; power response is instant, the wheel weights up and you feel those nooks and crannies in the surface of the tarmac a little more. Body roll, while minimal in Comfort, is further reduced in Sport, and makes you want to push the 2.5-tonne SUV just a bit harder. Braking uses both discs and energy-saving regen, seamlessly switching between the two depending on your application. It works very well, with little jolting or juddering as the system switches between the two. 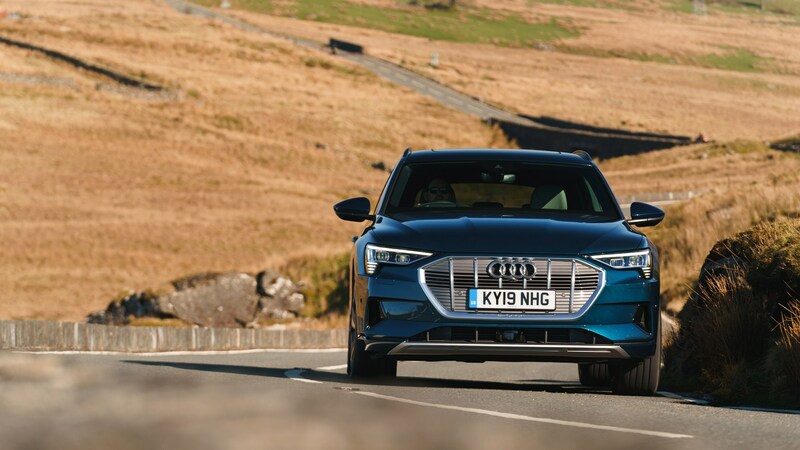 On motorways, you’ll find the e-Tron like any other car – except for its effortless ability to overtake. Wind noise and tyre noise are even more apparent without the hum of combustion, though, and you’ll notice whistling around around the wing mirrors and A-pillars. We were driving a conventionally mirrored model; it’ll be interesting to see if the lower-dragged, electric-cameras have a big impact on wind noise. And some more on the e-Trons webcams. They’re actually legal in the UK, and they’re able to slightly enhance the image they receive, so you actually see more with them in low-light conditions. They’re standard with the £82,270 Launch edition e-Tron - not the entry-level £71,520 car. If you want them on anything other than launch-spec, the cameras will set you back £1250. And what about those paddles? Look around the cabin, and you won’t find a B-mode for increased regen; instead, Audi’s mapped that function to paddles behind the wheel. Tap the + paddle to increase resistance and energy recovery, and pull the – paddle for less. In some ways, it makes sense to have it behind the wheel; it’s a form of engine braking or ‘gear’ use – but it’ll take time to learn and use it intelligently. Of course, the new Audi e-Tron isn’t a sports car, and when you’re doing anything other than accelerating in a straight line , it can’t really repeal the laws of physics. Body roll isn’t a large factor, but, the height and the weight of the car is more apparent on corner entry. It’s very much the same experience you get in something like a Tesla Model X; it’s a supercar when going straight ahead, but you’re acutely aware of every kg of its weight when you’re doing anything else. In many ways, the e-Tron is just like any other Audi, inside and out - but that’s what makes it exciting. It’s an SUV you can imagine slotting easily into your everyday life, with more charging options, and packages easing you over the ever-shrinking hurdles of EV ownership. The e-Tron is sailing imperiously over Abu Dhabi’s highway, which is Romanesque in its straightness and Clooney-esque in its smoothness. The occasional bump or scarred tarmac patch barely ruffles the standard air suspension with continuously variable damping, despite Launch Edition cars rolling on 21-inch V-spoke alloys. The ride quality feels organic, gently rising and falling like the chest of a slumbering person. The steering is alert, briskly jumping to attention as you swing off the dead-ahead, perhaps a touch light though this can be tweaked using Audi’s Drive Select modes. There’s a good spread of in-built adaptability, with variable ride-height so the e-Tron can go from low-slung aeroliner to teetering rock-scrambler, and adaptive damping to swing from tauter sport to pillowy comfort. Plus there’s the versatility of continuously variable all-wheel drive, naturally badged quattro. But it’s far removed from the clunking diffs and hollow gearsets that made the rally legend. The e-Tron has an electric motor on each axle, spinning the wheels via a single-speed planetary gearset. In Drive mode, total output is 265kW (355bhp), but the range-preserving limiter comes off in Sport mode to yield a maximum 300kW (402bhp). Typically the e-Tron is rear-driven but the system can instantly vary the twist action at each axle, changing the bias quicker than a mechanical system could manage. That flexibility also helps conquer wet grass or snow, or off-road terrain in alliance with the variable ride height. How quick: fast or plain ludicrous? Bury the accelerator from standstill in Drive and the e-Tron, though brisk, doesn’t steam forward with the instant, giddying surge of a ludicrous Tesla or the punchy Jaguar i-Pace. It’s accompanied by a noticeable and likeable electric whirr, a comforting link to the age-old combustion engine chatter which makes for a more charismatic powertrain than the quieter Jag’s. Mid-range rolling acceleration is plentiful: a quick squirt to pass the ubiquitous, lumbering Toyota and Nissan big SUVs and the urban 60kmh threshold is long gone, unwise in a country where traffic police are urged to display zero tolerance. Out of the window, Abu Dhabi appears desolate between its urban areas. Sand dunes look welcomingly benign but would be anything but in the 45˚C summer sun; I see more hitchhikers on this 28˚C morning than you would in a year on the UK road network. A trio of camels strut proudly behind a wire fence; they would make for a very uncompromising obstacle if they strayed onto the highway, with its limit typically 140kmh (87mph). 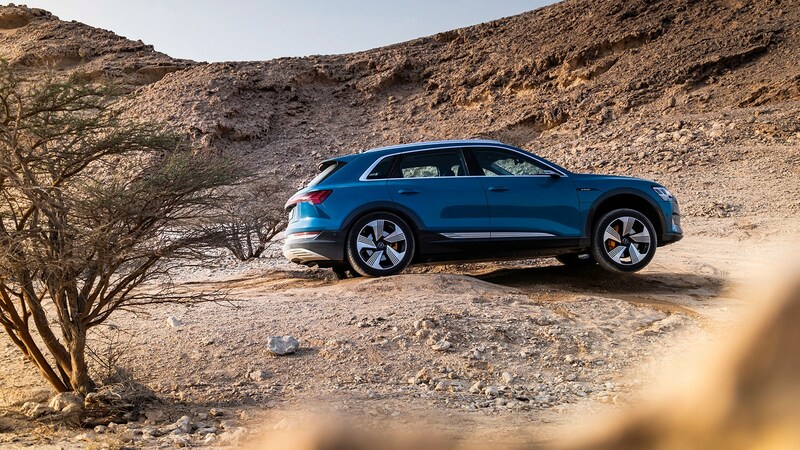 At this speed the e-Tron displays some low-level wind noise, no doubt accentuated by the EV’s mechanical refinement: for sure it’s a serene cruiser in the Middle East, though that might not be the case on the potholed roads of middle England. V8-powered trucks and a CLA45 AMG roar past bombastically, appearing a little uncouth next to the sophisticated civility of the e-Tron. Our first major stop is the Jebel Hafeet Mountain Road, a 11.7km, wriggling hillclimb with rubber smeared on the hairpins and impact marks from Abu Dhabi’s unlucky road racers along the protective wall. The e-Tron SUV is an imposing car, almost the length of an A6 Avant, taller and weighing a bloated 2490kg unladen. 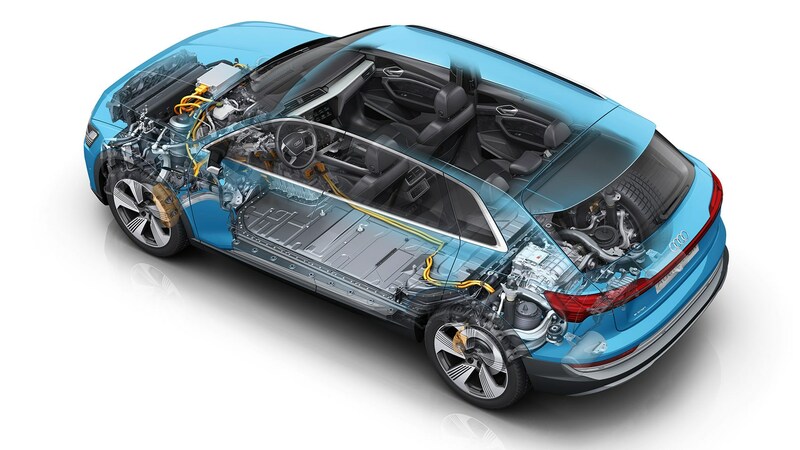 Its naked chassis doesn’t look to have a centre of gravity as low as the I-Pace’s: there’s a second tier of battery cells above the lithium-ion filled floorpan (all liquid cooled), and the front motor appears almost as lofty as a combustion engine’s valvetrain. But this perception swiftly dissolves as the e-Tron scythes up the mountain road. There’s that responsive steering again, pointing the nose crisply into corners and, with the right entry speed, no understeer just mighty grip. The e-Tron feels fluid and composed, with the computer-controlled all-wheel drive system braking the inside wheels to help pivot the e-SUV into tight bends. ‘There’s no way an SUV with mechanical four-wheel drive would be as comfortable and agile up there,’ drivetrain engineer Victor Underberg tells me afterwards. I reckon that Jag’s I-Pace would have felt more ballerina nimble, but the e-Tron’s muscular litheness smashes it like a rugby winger. Impressive given the chassis is steel, with only a few aluminium panels to trim weight. We reach the mountaintop with 81km of range (50 miles) remaining in the 95kWh battery pack. The descent demonstrates the power of the e-Tron’s energy recuperation: lifting trickle charges the battery as you coast along. The brake pedal, with its two-stage action, is more potent. First it activates the integrated braking system to turn the motors into generators to top up the cells more prodigiously than coasting, then it kicks in the hydraulic brakes if you need to pull more than 0.3g of stopping power. We generate an additional 11km coming down the mountain – Audi reckons it could have recouped 15km from more aggression on the stoppers. Indeed, the Germans claim it’s the most effective recuperative system on the market, recovering more than 70 per cent of e-Tron operating energy input. Some electric cars – Nissan’s new-gen Leaf springs to mind – are being marketed as a one-pedal driving experience: lift and the car decelerates like you’ve smashed into a brick wall. Switch the Audi’s energy recuperation to manual via a touchscreen menu (or with a toggle of the steering wheel paddle) and the e-Tron does slow more noticeably when you lift, but it’s smoother than a Leaf’s dramatic lurching. A tech breakthrough: cameras replacing mirrors? 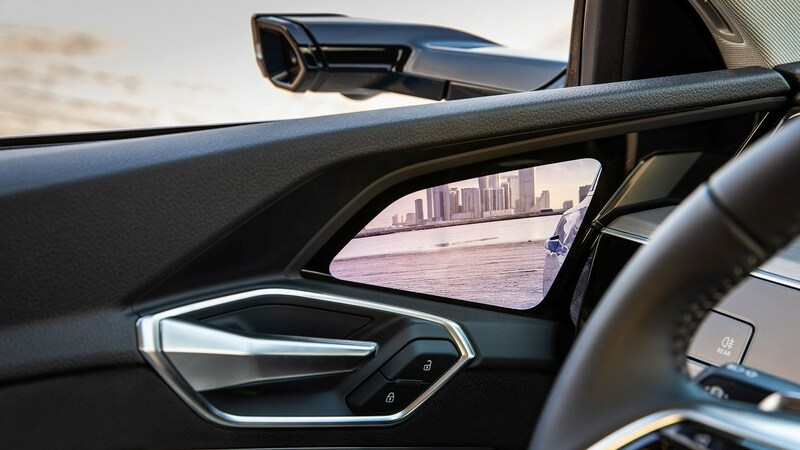 The e-Tron is the first production car to replace side mirrors with rear cameras mounted on spidery black spindles. It took all day and in excess of 200 miles to get used to looking further down than usual, at screens mounted in the doors just above the door handle. The resolution is sharp enough, but the screens are subject to glare and a bit fiddly to adjust by dragging a finger around the screen. To replicate a regular blind spot warning system, the perimeter flashes if there’s something in your danger zone. This is an important digital failsafe, because for me visibility is not quite as clear as a bog-standard mirror’s. 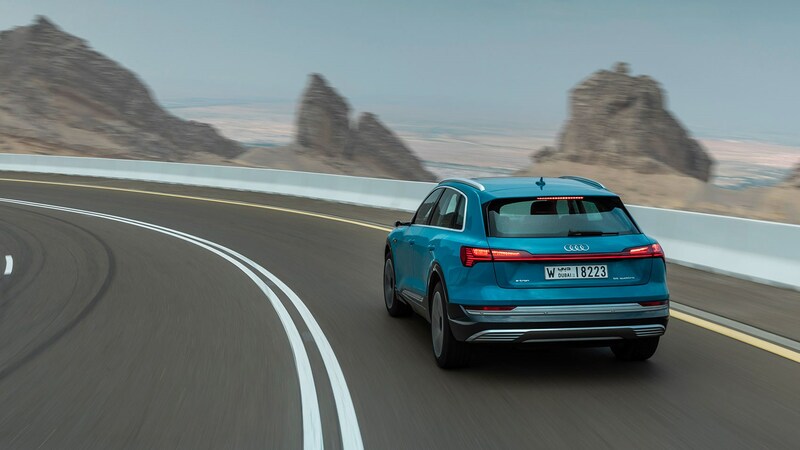 Audi has implemented them nonetheless because they deliver an additional 3 to 6km of range; when specified they reduce the e-Tron’s drag coefficient from 0.28 to 0.27. How far will she go, mister? Some electric cars can pull some nasty surprises with their range evaporating at an unexpected rate. In the Middle Eastern afternoon warmth, the stoical e-Tron exhausted its batteries not far off a 1:1 basis. Hammering along at 140kmh and chugging across a desert track, we travelled 193 kilometres, with a trip computer calculation suggesting we’d depleted 219km of range. On the WLTP economy cycle, the e-Tron’s range is ratified at 400km (248 miles). The battery pack can cope with multiple charging systems, from UK households’ plain old 230 volts of alternating current to a 150kW DC ultra-fast charger, which will replenish the cells in just 30 minutes. Today those chargers are rarer than unicorns in Great Britain, but BP Chargemaster will start rolling them out in 2019. At home, owners can install an 11kW charger running off a 400 volt three-phase outlet, which will v-max the battery in eight hours overnight. What’s the e-Tron like inside? Under the skin there are some electric car breakthroughs; on the surface the e-Tron looks disappointingly conservative, just another Audi SUV spun off the MLB components set like the Q5 and Q7. Yet engineers say the e-SUV has a bespoke platform and shares only its steering and air suspension with MLB-based cars. Regardless there’s no evidence of the packaging flexibility that gives Jaguar’s I-Pace a longer wheelbase in a far shorter car, or the cleverness of VW’s forthcoming MEB electric platform which will pack Passat space into a Golf-sized EV. 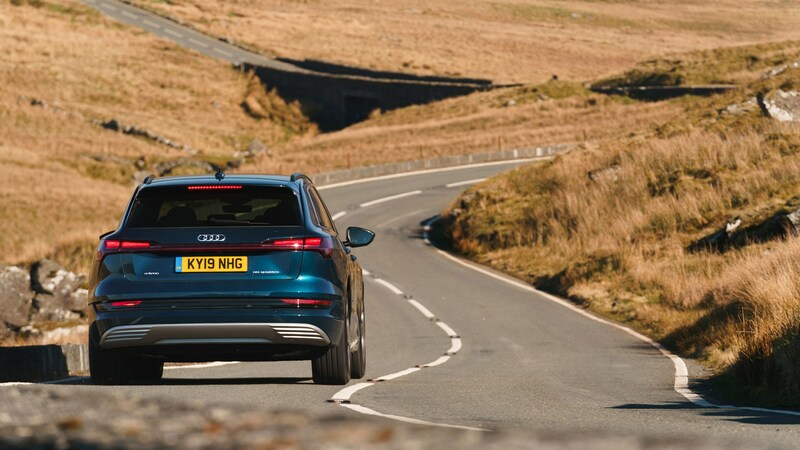 To create what is a very spacious car with generous rear legroom and headroom, Audi has sized it close to the Q7 in length but the Q5 in height. The wide boot stows 605 litres (and there’s underfloor storage which isn’t always possible in electric cars), extending to 1755 litres with the rear seats folded. Up front the infotainment system is operated by Audi’s twin touchscreens, the lower of which seems a bit under-utilised: it merely displays air-con controls, unless you’re conducting a search and use your finger to scribble letters or words on the screen. Audi is entering the electric age with the e-Tron, which costs from £71,490 (before the Government’s £3500 subsidy for which the e-SUV qualifies). As you’d expect, the e-Tron’s engineering is polished, what you might not expect is how well it handles given its vast size and weight. The e-Tron is also comfortable and spacious, and will hit the spot for wealthy Audi fans keen to embrace zero emissions. Progress through technology? The future, it appears, is very much Vorsprung Durch Elektrisch. Jaguar i-Pace review: at last we drive Jag's first EV!